I’ve received items from a battle that I haven’t been able to use yet. I used to put these things in my Bank back at the house so I didn’t accidentally sell them. Now, you’ll find a new button at the bottom of your backpack to protect items you want to keep safe from being sold. Here’s the Pet section of My Backpack. I have 4 pets currently, that I’m training up. Typically you can’t sell items in your backpack that you have equipped. But if you cycle through your pets, you could release your favorite pet and accidentally sell it. Now that the Royals and KingsIsle have made a long awaited updated this summer, you have an option to protect your Booty and protect them from accidentally being sold! Look at your backpack window. You’ll find a new button at the bottom right side of the window. It’s a gold coin, with the familiar “No” red circle over top of it. Click on the item you want to keep safe, click the Protection button and you shouldn’t have to worry again. You can always move items out of your backpack and into your bank to hold for later. Simply jump to your dorm room, your house or your Captain’s Cabin, and you’ll see a safe in the bottom right corner of your screen. This button will bring up your Backpack, Bank and Shared Bank window. The three buttons on the left side of the window will tell you which of your storage areas you’re looking at. The top Safe is your Bank. The Center is your backpack. The bottom safe with the double-sided arrow is your shared bank. The buttons on the bottom right, allow you to move items between your storage areas. In the image above, we’re looking at the Shared Bank, click on an item you want to move, then select the area you want to move it too by using the bottom navigation buttons. In the image above, we’re moving the first item in the Shared Bank Ship section, to the Backpack. The Bank and Backpack are for your pirate, they’re private and only you can see them. 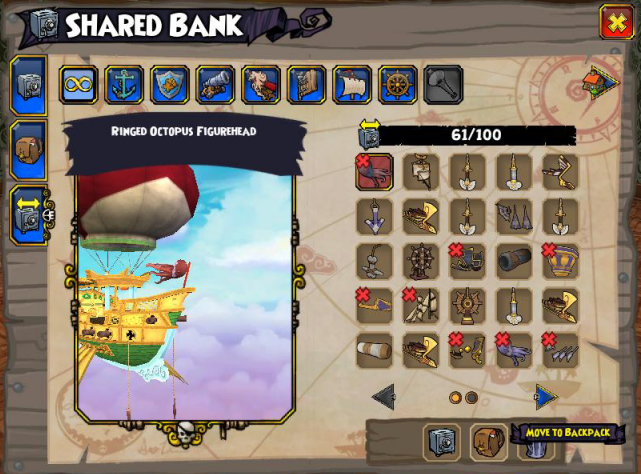 The Shared Bank allows you to share items between all your Pirate Captains. If you received a Witchdoctor weapon in a battle while playing your Buccaneer Captain, you can move that weapon into the Shared Bank, switch Pirates to your Witchdoctor, and move the item from the shared bank to that Witchdoctor’s backpack. Not all items are shareable. But most are. There are several interesting elixirs you might want to check out in the Crown Shop. These can help you pick up and hold onto more loot than normal! As soon as you purchase the potion, its magic will take effect! This entry was posted on September 19, 2018, in News and tagged backpack, bank, booty, don't, items, moving loot, Pirate101, protecting, saving, sell, shared bank, transfer between captains. Bookmark the permalink.